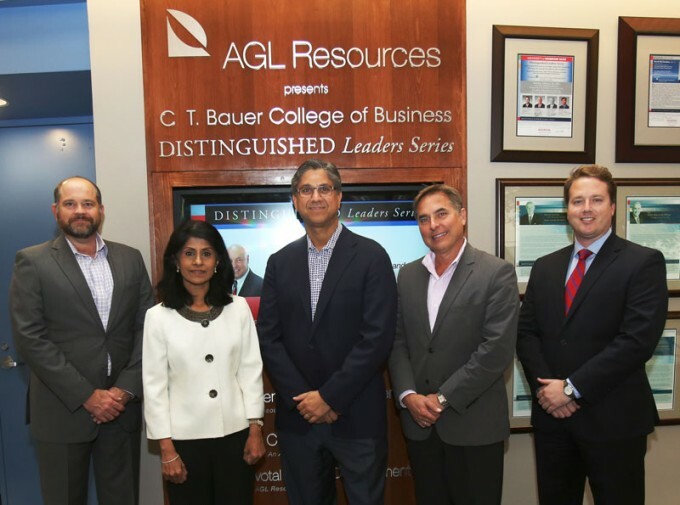 Thanks to the sponsorship of AGL Resources and its Houston-based energy companies, the Distinguished Leaders Series helps connect students to industry professionals for discussions on issues facing the energy industry. Pictured here are (from left) Sequent Energy Management Vice President of Structure & Strategy Berney C. Aucoin; Bauer Dean Latha Ramchand; AGL Resources Executive Vice President Peter Tumminello; Sequent Energy Management Senior Vice President of Marketing Marshall Lang and Bauer College Development Officer John Ryan. Aurora Oil & Gas began its operations in Texas in 2006, expecting to find its next venture in the state’s booming energy sector, but it also found its first CEO. Aurora Oil & Gas CEO Douglas E. Brooks spoke on “Land Management & Being a Landman” at the first Distinguished Leaders Series event of the fall semester at the C. T. Bauer College of Business at the University of Houston. Held in Cemo Hall on Oct. 15, the series is presented by AGL Resources and their Houston-based companies and highlights topical energy issues in business. 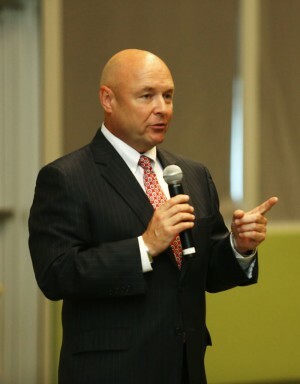 Aurora Oil & Gas CEO Douglas E. Brooks spoke to students and the Houston business community about land management during the first Distinguished Leaders Series of the fall semester. Brooks is CEO of Aurora Oil & Gas, an Australian based company. He got his start as a “landman,” a position that gave him experience in the area of land management in the energy industry. What sets energy apart from other industries in the United States is its integrated business efforts, Brooks said. Brooks finished off his talk with advice on the importance of staying involved to become a leader in the energy industry. The next Distinguished Leaders Series event is a panel discussion titled “The Future of Electric Power Generation” on Nov. 6. Click here to register for the event.